FAVORITE COMFORT FEATURE: Do It Yourself personalization provides an economical option for consumers shopping for a lighted address plaque. Weather-resistant, high-impact, textured polymer frame with raised numbers. Visible at more than 100' away during the day and at night. Attaches directly to an existing doorbell system. 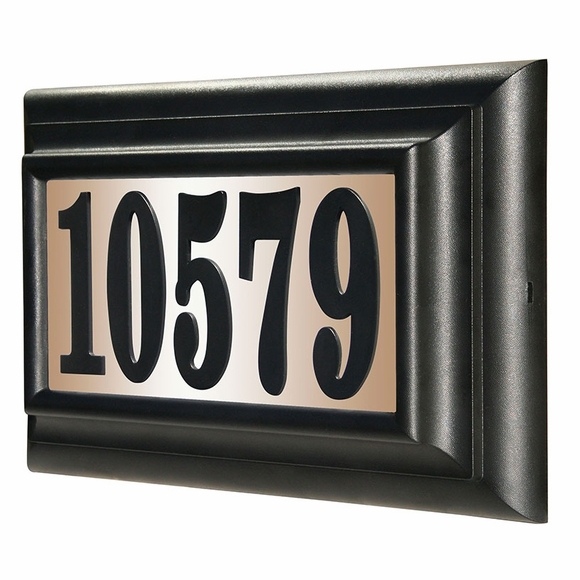 Dimensions: 13.75"W x 2.25"D x 8.875"H.
Note: If you are hanging this address plaque in a spot without access to a transformer, you will need to purchase and install either a plug-in or hard-wire transformer (sold separately; see Related Products). *** If your address has more than two of any number, please provide the complete house number in the comments section of the order form so that we can request the additional vinyl number(s) for you.